Cranetec can provide jibs which have a smaller scope than the gantry cranes, and can be a useful tool for repetitive work station operation, such as stacking objects on pallets or simply moving them from one fixed point to another. Our jib cranes can be rated up to 3.2T SWL. The maximum length of the jib arm is dependent on the amount of weight to be lifted. The jib cranes are extremely versatile units which can easily be adapted to your specific requirements. For example, jib cranes can be mounted on floors, walls or existing supports. Jib Crane is a crane type that makes use of a mounted arm to move, lift and lower material. This mounted arm, which lies perpendicular or at an acute angle, upwards via a pillar, rotates along the central axis to a limited or full circle. These cranes find ample utility in warehouses, docks and also while loading and unloading shipping containers of large sizes. These cranes are extremely versatile in nature and can be installed on walls, floors or even existing supports. The Jib cranescan be rated up to the maximum length required of the Jib arm and depends on the amount of weight to be moved. Jib Cranes are not restricted to particular locations and can also be mounted on mobile chassis to be utilized as temporary work sites and in military operations. The cranes compromise lifting capacity to achieve mobility. The Jib Cranes, possessing less scope than gantry cranes, are useful in repetitive work station tasks, like stacking objects on pallets or also in transporting them from one point to another. Let’s know in brief about these three different types of Jib cranes. 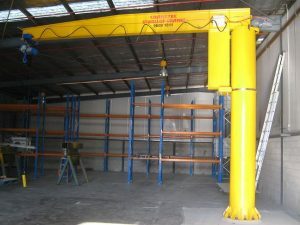 Floor Mounted Jib Crane: This is the most common type of Jib crane, which is a self-supporting crane that possesses a vertical mast mounted over a concrete foundation. These cranes help in sharing the load of main cranes. The cranes can rotate full circle up to 360 degree and are operated manually. Wall mounted Jib crane (Fixed): This type of Jib crane is mounted on a wall horizontally and relieves the vertical shaft having a column bracket mounting. The floor mechanism is similar to floor mounted crane, but the vertical boom is missing. The RCC column helps in a 200 degree rotation and covers the area near bracket mounting without causing any obstruction at floor level. Wall mounted Jib crane (Travelling): The crane is much similar in construction to a fixed type Jib crane, differentiating in a feature that these cranes can over the area lengthwise near the column of the building with obstruction at floor level. These cranes are most commonly used alongside overhead bridge crane for easy movement of small loads. These Jib Cranes help bridge cranes with heavier loads, ensuring improved work flow. The crane here does not rotate, but travels along the runway track suspended along the columns of the building. Jib Cranes comprise of all cranes which have a rotating boom attached with a vertical mast, supporting a hoist which runs electrically or pneumatically. These cranes find use in not just construction areas, but military ships and commercial places as well. Cranetec offers Jib cranes, which have a smaller scope than the gantry cranes, and can be a useful tool for repetitive work station operation, such as stacking objects on pallets or simply moving them from one fixed point to another. Our Jib cranes can be rated up to, the maximum length of the Jib arm and is dependent on the amount of weight to be lifted. The Jib cranes are extremely versatile units which can easily be adapted to your specific requirements. For example, Jib cranes can be mounted on floors, walls or existing supports.